The highest yielding oat variety on the 2017 AHDB Recommended List and the most popular variety in the North of England and Scotland. Good specific weight, average kernel content and relatively low screenings. Slightly shorter than average and of average straw strength. Maturity is slightly earlier than average. 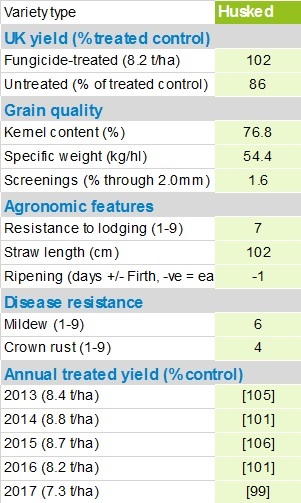 With average scores for both Mildew and Crown Rust, Aspen offers a decent agronomic profile.